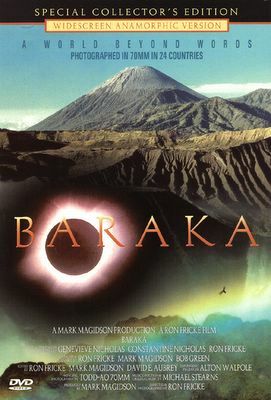 Baraka is an incredible journey through 6 continents, 24 countries. Painstakingly shot on Todd AO-70mm film. Baraka has no plot, contains no actors and has no script. Baraka is a collection of high quality images, presented in a moving and compelling manner. Baraka is evidence of a huge global project fueled by a personal passion for the world and visual art. Working on a reported US$4 million budget, Ron Fricke and Mark Magidson, with a three-person crew, swept through 24 countries in 14 months to make this stunning film. One of the very last films shot in the expensive TODD-AO 70mm format, Ron Fricke developed a computer-controlled camera for the incredible time-lapse shots, including New York's Park Avenue rush hour traffic and the crowded Tokyo subway platforms. Is this something like Koyaanisqatsi? Pretty much so. This guy Ron Fricke was the cinematographer on Koyaanisqatsi. I also wonder how's the soundtrack compared to Philip Glass's.